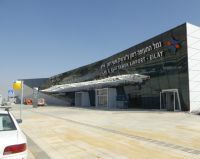 The airport is named in memory of the first Israeli astronaut Ilan Ramon, who perished in the Space Shuttle Columbia disaster, and his son Assaf Ramon, who died six years later when his F-16 fighter jet crashed over the West Bank. The site takes in 2.2sq mi with the terminal covering more than 500,000sq ft. The total cost is put at $530m. International travel to and from Israel has skyrocketed since the Jewish state and the European Union ratified the Open Skies agreement in June 2013, opening up competition between Israeli and European airlines. Ramon has been allocated IATA code ETM / ICAO code LLER and is now licensed by the Israeli Civil Aviation Authority, which follows the ICAO guidelines. It will replace the current Eilat Airport, set in the very centre of the city and used only for domestic flights. International services operate out of Ovda (VDA), a military airfield, 40mi to the north. ETM is run by the government-owned Israel Airports Authority (IAA), which also takes in Ben Gurion International Airport (TLV), the controversial Sde Dov Airport (SDV), also known as Dov Hoz, north of Tel Aviv (See BTN 5 November), and several small airports in the north of the country. Avi Yaniv, our host on behalf of Eilat Airport's managing director Hanan Moscovitz, told us: “The airport is technically finished. All that remains to be completed are the public amenities. 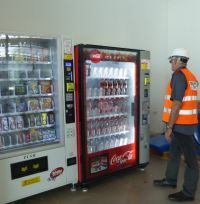 We are continually testing the facilities by performing run-ups and training staff. Eilat Airport was established in 1949 at a time when the town itself was ready to develop as Israel’s entry port from the Gulf of Aqaba and the Red Sea. It has rapidly expanded and now is a city of 60,000 inhabitants and a major tourist resort. It has a good relationship with its Jordanian neighbour Aqaba, and the historical city of Petra is a popular tourist destination. The border terminal is being managed by the IAA and 1,500 Jordanians commute into Eilat on a daily basis for work within the resort. 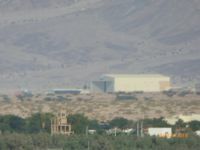 Aqaba has its own airport, within sight of Ramon, but for political and practical reasons the concept of a joint aerodrome was never pursued. The current Eilat Airport really does sit in the city centre, splitting the town in half. Jets land on a regular basis and sitting on your hotel balcony or dining al fresco is not for those who love peace and quiet. Even the glorious beaches are not immune from the nuisance, either on the flight path or just off it. Once the airport is closed there are ambitious plans to expand the existing waterways and leisure craft facilities, and develop a large eco-friendly park, hotels and also major entertainment facilities. Eilat in ten years’ time will be totally different and a generation yet to be born will find it impossible to believe they are treading on what was once an airport. Wizz and Ryanair are the two main airlines currently flying out of Ovda, attracted by the incentive rates offered by IAA. There are a number of seasonal operators including Finnair, Lufthansa, Transavia. All of these will transfer when Ramon opens. EasyJet, the largest low-cost operator into Israel (TLV) is known to be keeping a watchful eye on the situation. For existing carriers the change will make little difference, but potential airlines will need time to re-route aircraft and market the destination. A real enigma is El Al (LY), which withdrew from Eilat some years back and finds it impractical to compete on the limited TLV-ETH market against Israeli airlines Arkia (IZ) and Israir (6H). The solution could be what in airline terms is a W operation, aircraft operating out of Tel Aviv to a major airport, such as Heathrow, down to Ramon, and back the same way, with a crew change at Eilat. The big advantage, besides flying the flag for Israel’s southern resort, is to give connections with partner airlines, known as a codeshare. The new runway is 3,600m (11,800ft), capable of taking the largest aircraft and sits 7m below the terminal arrival area. Only line maintenance is available at the present time, although it could be expanded, but no hangarage is planned. General Aviation aircraft will be using the airport and the new professional pilot training academy at ETH will move. The approach by road from Eilat to Ramon through the Timma Valley on the A90 highway is impressive, with dramatic desert mountains on both sides. The highway road continues to Tel Aviv 220 miles away, and via the Dead Sea, 210 miles to Jerusalem. There are plans for a rail link to the centre of Israel but more possible is a tramway to Eilat. The land has been set aside. Occasional flooding is a real problem and Israeli engineers have been clever in moving a wadi that went through the airport site but now drains well. A recent thunderstorm proved that it works! Entering the large airy building is typical of a modern airport with electronic facilities available and 32 manual check-in desks. The ceiling is birchwood but there is plenty of glass to reduce the necessity of power-consuming lighting during daylight hours. You will be watched by “common sense security” before passing through immigration (for passengers departing abroad). If you are an IAA regular, you will have been dealt with by an automated questionnaire. Your luggage would have been given two tags, a first for any airport worldwide. Domestic and international passengers stay mixed with gate collection for duty free and there are the inevitable shops and eating opportunities. Choose kosher Burger King, but up-market dining is also available. The terminal covers 35,000sq m, including a 3,320sq m duty free area. Ramon features a 3,600m (11,800ft) runway and a current total of 29 apron parking bays, although 30 more are planned. There are no air bridges and the boarding arrangements allow for passengers to make the very short walk straight from the terminal – no need for the nasty staircase gates featured at such places as Luton. It is straight into the building on arrival, electronic immigration and up an escalator for luggage collection. The public area for meeters and greeters is yards away, as is transport. The landside convenience stores sit between arrivals and departures, a clever siting. There are no airport hotels and the former settlemet about half a mile away is seeing a new lease of life housing airport workers. In an arrangement between the Ministry of Tourism and the Ministry of Transportation aimed at encouraging tourism, Israel is to waive aviation fees at the Ramon Airport for three years and will offer a large incentive scheme. Currently Eilat is a VAT-free zone. There are no slot problems at an airport which will be virtually 24hr. Video The first test flight landed back on 5 September 2017. The facility is now nearly ready. Eilat can then build for the future.